I’m very interested in seeing how this move pans out. Donovan has looked great for the USA and in MLS of late, but in his two stints in Europe – both in Germany, for Bayer and Bayern – he looked out of his depth, not to mention homesick. Everton travel to Arsenal this weekend, and I doubt Donovan will feature, except perhaps as a sub. However, he is a versatile forward and could play on either wing, in the hole behind a front man, or even up front on his own – though the latter option is unlikely, given Donovan’s slight frame and the physicality of the Prem, which does take some getting used to. As Jen Chang points out on his ESPN blog, Donovan will do very well to displace either Steven Pienaar or Diniyar Biltaletdinov. “Out of his depth, not to mention homesick” may describe his performance at Leverkusen, but he was fine, if unspectacular, with Bayern. He certainly didn’t play well enough to warrant the kind of transfer MLS was going to demand, and he didn’t get enough playing time to really elicit much of an opinion one way or another, but he certainly didn’t look out of place in his limited appearances. I disagree. Somewhat. I saw Landon in Munich the few times he found his way onto the field, and yes, he was not out of place, but he was more often than not a bystander. Why is he wearing a bathrob? more importantly, why is he wearing bell bottom jeans? Yeah, I watched all of LanDo’s games at Bayern, and he definitely didn’t look like he didn’t belong on the same field as those guys. Sure, he didn’t score any goals in competitive games, but he’s a guy that is used to starting and finishing games, not coming on in the 68th. Bayern were also particularly poor in a lot of those games, and he was coming on for guys like Klose and Toni, completely different players than him, without any noticeable change in tactics or formation. I don’t know a whole lot about managing a football team, but I’m pretty sure you can’t sub out giants like Miro and Luca, who mostly play with their back to goal, for a speedster like LanDo and expect them to play the same way. 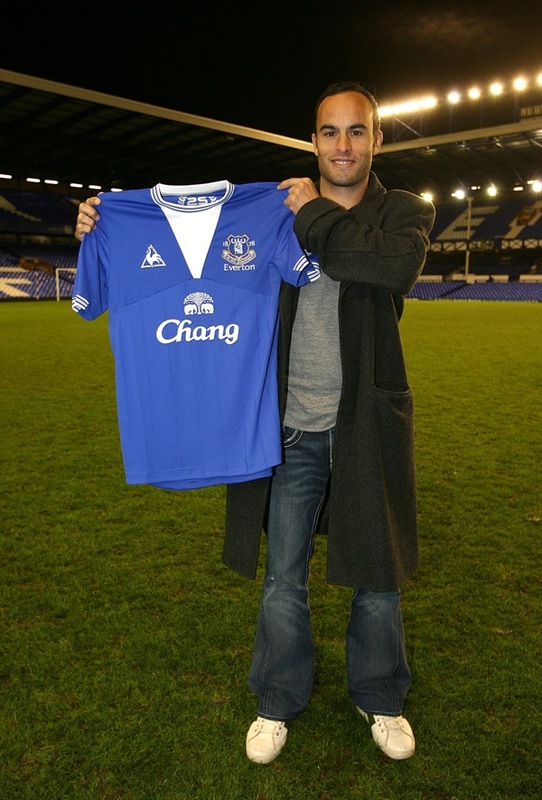 I think Everton is a great place for him to go, as he will get some time given their injury problems. If he gets a goal or two in the first month, he could get a good run of tough games to show whether he really blongs in the Prem or not. i might be bitter but i hope he fails……………..
Toffee tolerance is needed,and a little positive suppooooort. THIS MAN IS CLASS ACT,HE HAS MET AND SURVIVED THE WORST AND THE BEST OF COMPETITION, …….i CAN,T REMEMBER HIM BEING INJURED,SO LIGHTEN UP! LMFAO @ Bathrobe and Bell bottom jeans! horrible dresser!